We photocopy anything in print: documents, books or photos with quality that makes them hard to tell from the original. All work is completed by our staff, so you don't waste time and money producing copies that aren't up to snuff. We offer reductions and enlargements to improve legibility and fitting to reports. Additional charge for specialty-coloured paper. To get this price, we must be copying from your hard-copy original, not a digital file. Printing from digital files subject to a RIP depending on file size. Call for information. 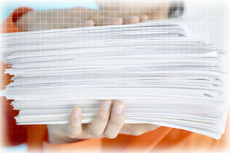 Photocopies can be made on a variety of paper types and sizes, including vinyl, NCR and adhesive-backed materials. We offer the widest selection of paper types and finishes in the region including several recycled products ranging from 25% to 100%. Paper/Finish: A complete range of papers from 20-lb text to 12pt card stock (270 gsm), coated (gloss), uncoated (matte). Specialty papers and colours. Options: Single-sided or double-sided, multiple-up, enlarged to 800%, shrink to 10%, stitching of large images. Image enhancement, modify colour, convert to gray-scale. Finishing: Folding – roll, half, Z-fold, Stapling – corner, side and booklet, Punching – 2-hole, 3-hole, Cut-down and trimming to any size. Turnaround: While you wait (small orders), Next day for most large jobs.